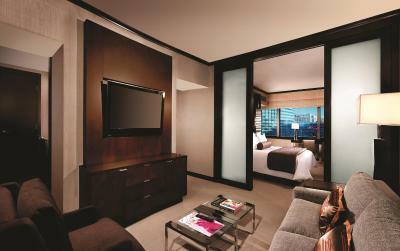 Lock in a great price for Vdara Hotel & Spa at ARIA Las Vegas – rated 8.8 by recent guests! Like your own live in apartment, when return to room after being out for the day.. knowing I left the room a mess... the room and my things were organized, everything was clean... I would definitely stay here again!!! The staff was exceptional. So helpful and friendly which made us feel very welcome. Very clean and comfortable. Thanks! Excellent value, definitely glad we paid the upgrade for club access, great food verity each day. It’s great to be able to comeback to a smoke free environment after a day on the strip. The bed was very comfortable and the gentleman that checked me and my wife into the room made sure we got a great view of the Vegas strip. The perfect solution for a fun filled (but not exhausting) time in Las Vegas - close enough to the lights, excitement, and noise of the Aria casino and other entertainment, but provides a private haven to recharge and do it all again. Staff was excellent in all aspects - bell hop, valet, registration, Vice Versa lounge, etc. Vdara had enough of the amenities - especially a Starbucks and some food options - to allow me to not have to venture out as often. Room was amazing - had fountain view room, with small kitchen area, wonderful bed and bathroom, and living area. For the amenities and square feet, this is a GREAT option. The property was centrally located close to everything. Lovely room quiet and beautifully appointed, love that there is a Starbucks right downstairs. The gym facilities are nice, only minor complaint was getting wrong order on my room service breakfast. Would stay here again, very nice oasis to come back to after day of hectic meetings at my conference. 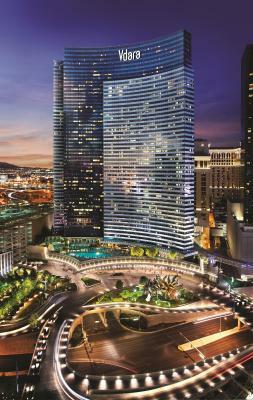 The Vdara is unlike any other hotel that is on the strip. It does not have a casino and it is non-smoking. This is great as it gives you respite from all of the smoke that the casinos have. The rooms are quite large and clean. We ended up being upgraded because of an issue they were having in the room above us and let me say that the city corner suite is amazing. The view of the city was great, plus the regular sized amenities, were a great perk. The siting area was also quite roomy. It had doors that separated from the room so that my wife could enjoy TV in the mornings while I was still sleeping in. Although it seems like its far from the strip its really not. A small walk through the walkway into the Bellagio and boom you're right at the strip. Overall it was a great hotel and I can see myself coming back again. Excellent place to stay in. I love the spacious room, clean and comfortable bed. The view from our room is stunning! Steve from the reception is extremely friendly and efficient. The provide smooth & quick check-in and check-out services! I love that the hotel has a Starbucks in the lobby; there is a Market cafe too, but I find it too expensive. We prefer to get our food on the Strip which is just 5-7mins walk away. we would definitely come back if we are traveling to Vegas again. 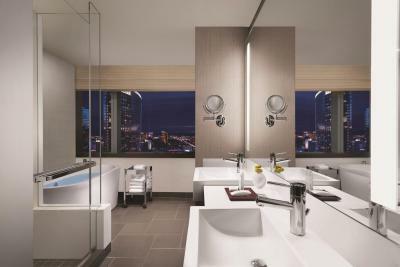 Vdara Hotel & Spa at ARIA Las Vegas This rating is a reflection of how the property compares to the industry standard when it comes to price, facilities and services available. It's based on a self-evaluation by the property. Use this rating to help choose your stay! 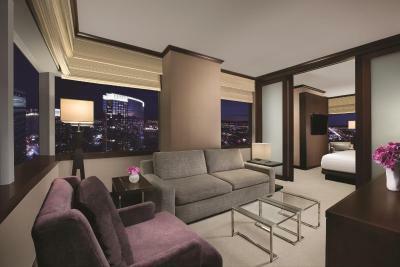 One of our top picks in Las Vegas.This resort is located on the Las Vegas Strip and features a full-service spa. All suites provide an iPod docking station and a 42-inch flat-screen TV. 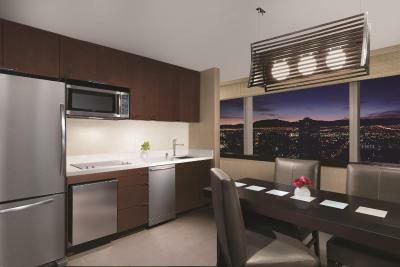 The modern suites at Vdara Hotel & Spa at ARIA Las Vegas include a kitchenette. A dining area is provided. This all-suite non-gaming, nonsmoking resort offers special suites for dog owners and their dogs. Vdara Hotel & Spa at ARIA Las Vegas features a rooftop pool surrounded by plunge pools. Snacks and cocktails are served at the poolside bar. Vdara Hotel & Spa at ARIA Las Vegas features the Market Cafe, a boutique grocery store and cafe, providing the option to grab a quick bite or purchase fresh items. Vise Versa Patio and Lounge at Vdara serves cocktails in a contemporary lounge setting by night. Live music is also offered every Friday and Saturday night. 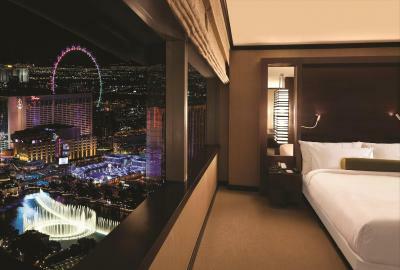 Vdara Hotel & Spa at ARIA Las Vegas, walking distance to ARIA Resort & Casino and connected to Bellagio, has a variety of dining, casino and shopping venues just minutes away. 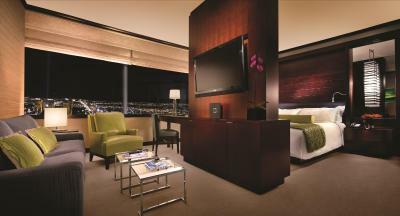 When would you like to stay at Vdara Hotel & Spa at ARIA Las Vegas? Featuring views of the pool or the lake, this room features flat-screen TV and a private bathroom. A bathrobe and slippers are also offered in this spacious suite. This spacious suite features a washing machine, dryer, and separate living area with a sofa bed. A bathrobe and slippers are also offered in this spacious suite. 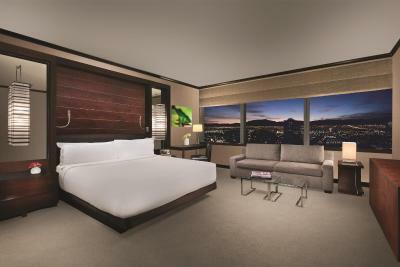 Featuring mountain and city views, this spacious suite includes a kitchenette. A large soaking tub is provided. Featuring expansive views of the city center, this spacious suite boasts a spa-style soaking tub. Guests can prepare meals in the kitchenette. This studio includes a separate living room area with a divider that provides added privacy from the bedroom. It also features a 42" flat-screen TV,a spa-like bathroom and a kitchenette. 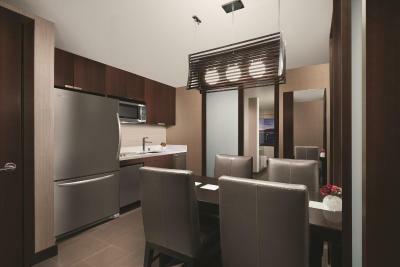 This suite features a dining area, microwave and air conditioning. Two buffets per stay are included. The promotion is valid for a maximum of two (2) breakfast or lunch buffets per stay, per room. Restrictions apply. This suite has air conditioning, dining area and stovetop. This suite features a spa bath, dining area and mini-bar. 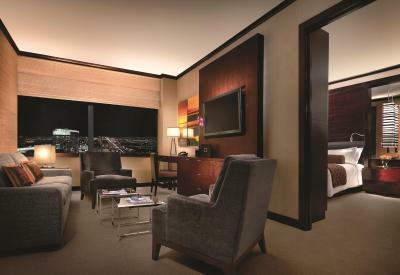 This room includes added access to the Vdara Club Lounge. This suite has a tumble dryer, bathrobe and dishwasher. This suite features air conditioning, dining area and cable TV. For on-property activities, retreat to the intimate ESPA at Vdara, lounge poolside in the privacy of your own exclusive cabana or hit the Fitness Center. Hotel surroundings – This neighborhood is a great choice for travelers interested in shopping, nightlife and city walks – Check location Great location - show map Guests loved walking around the neighborhood! 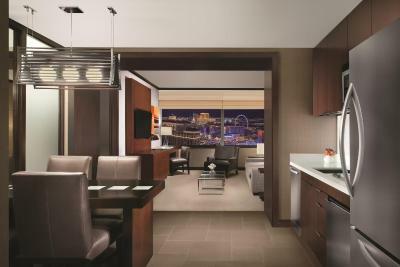 House Rules Vdara Hotel & Spa at ARIA Las Vegas takes special requests – add in the next step! Vdara Hotel &amp; Spa at ARIA Las Vegas accepts these cards and reserves the right to temporarily hold an amount prior to arrival. Vdara Hotel & Spa at ARIA Las Vegas accepts these cards and reserves the right to temporarily hold an amount prior to arrival. - Please note: Live music occurs every Friday and Saturday night from 20:00 through midnight. 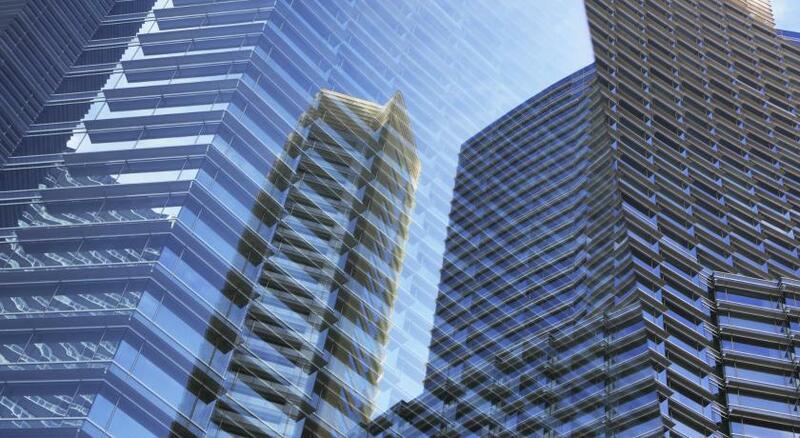 - For your convenience, the Vdara offers valet parking for a fee. - Any required deposit or pre-payment will be charged to your card at the time of booking. - In case of an early departure, guest will be responsible to pay the full remaining amount (room rate and tax) of the reservation. 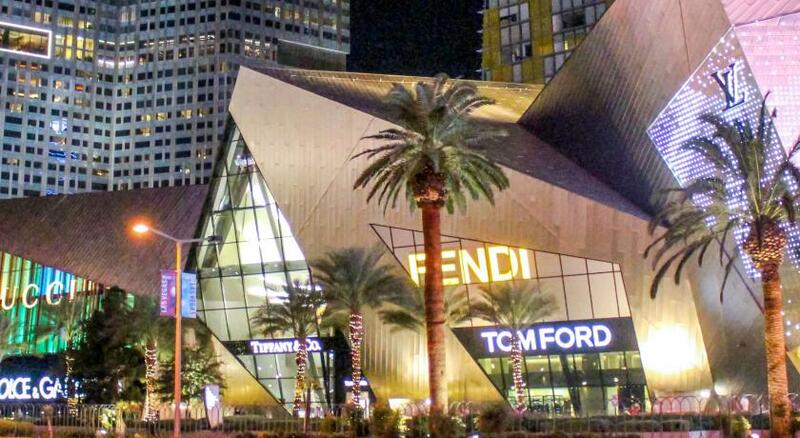 - Per Vdara Hotel & Spa at CityCenter Las Vegas policy, please ensure the original credit card used at the time of booking is presented during check-in. - Must be at least 21 years old to check-in. The property will place an authorization on credit or debit card to cover applicable charges for room, tax and resort fees, as well as a USD 100 incidental amount per day to allow you access to room charging privileges. 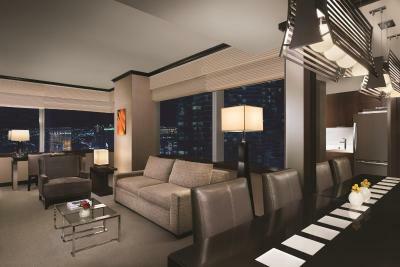 For guests that pay the incidental deposit in cash, there will be a USD 250 charge per stay. This may result in additional authorizations should your charges exceed the originally approved amount. Guests using a debit card in lieu of a credit card acknowledge unused funds are released upon check-out may take 3-7 business days for domestic banks and up to 30 days for international banks to become available through their financial institution. Windows on south facing floors have a film cracked and peeling. This made for a poor view. Had kitchen facilities but no equipment, need to bring own cups and ingredients if you want coffee or tea. 1 lit bottle of water $10... all food and drink in room unnecessarily overpriced. The studio room spacious with dining area and sitting area. Great view from 22 floor! They stored bags while we visited downtown on our departure day. I was very disappointed with the in room 'kitchen' as there were no amenities. You could get dishes etc. brought up but no coffee pot (Keurig available for rent), kettle, toaster. Kitchenette feature was a reason for choosing this hotel. The windows let noise into the room and at night there is a humming from the streets. Clean and comfy, close to the "action", quiet in general and no casino. 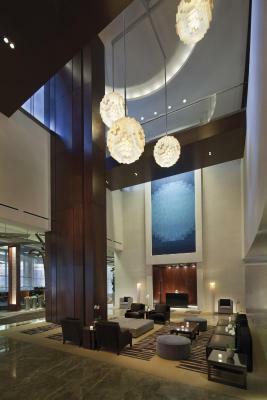 Absolutely clean and modern hotel. I do wish there was a few more food options inside. The mini bar was outrageously expensive and the cafe inside closed fairly early. Vdara was a unique Vegas experience as it wasn’t a casino hotel and thereby not mobbed with people walking in and out. I really enjoyed that. Nothing to dislike. Fitted our purposes perfectly. No cups, saucers, plates, cutlery, no wine glasses, no tea/coffee facilities BUT the room has a kitchen ! Large comfy rooms. Nice to be in an hotel without a casino. Walk through to Bellagio and to the Strip. The Vdara doesn't have a self parking garage. For guest using the MGM Resorts Self Parking option, you only have the choice of parking in the Aria or the Bellagio and both Self Parking garages are about 15-20 min walking distance to get to the Vdara. Since the unit has a kitchen, I would at least like a few utensils - maybe even if throw away - paper plates, cups, utensils? The kitchen was completely bare of anything to cook with or eat out of.